The Houston Astros and All-Star third baseman Alex Bregman agreed Tuesday to a six-year, $100 million extension through the 2024 season, multiple outlets reported. The contract takes effect this season, buying out Bregman's remaining three arbitration years as well as two years of free agency. 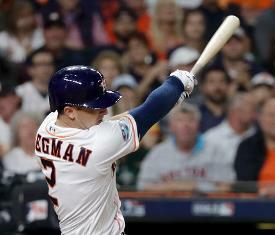 The Astros won the World Series in Bregman's first full season in 2017. He hit four home runs and drove in 10 runs in 18 games that postseason. The No. 2 overall pick in the 2015 draft, Bregman has batted .282 with 58 homers, 103 doubles, 208 RBIs and 224 runs in 361 career games. Earlier Tuesday, the Astros also reportedly agreed to a two-year, $17.5 million extension with reliever Ryan Pressly. The 30-year-old right-hander is under contract for $2.9 million in 2019 and would have been eligible for free agency after this season. The deal covers the 2020 and 2021 seasons. MLB Network's Jon Heyman reported that the new contract includes a third-year vesting option worth $10 million based on games pitched. Pressly joined Houston last July in a trade with the Minnesota Twins. In 26 games with the Astros, he was 1-0 with two saves, a 0.77 ERA and 32 strikeouts in 23 1/3 innings. His combined numbers for the 2018 season included a league-leading 77 appearances and a 2.54 ERA with 101 strikeouts in 71 innings. Pressly also pitched in five postseason games for Houston, allowing one hit and one run over five innings. Pressly made his major league debut with Minnesota in 2013 and has pitched in 307 games, all in relief. He is 18-16 with three saves, a 3.54 ERA and 314 strikeouts in 340 1/3 innings.